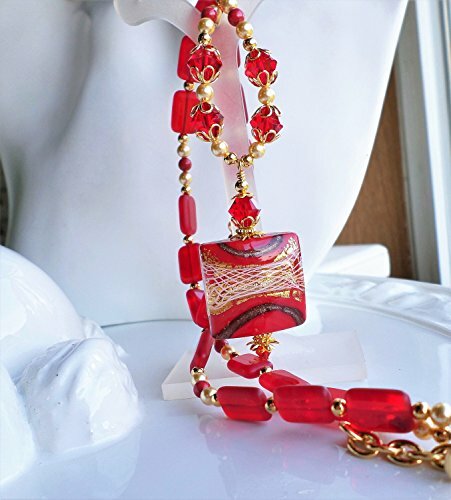 This colorful necklace features a large gorgeous pendant in bright Red and gold! The pendant is a Murano glass bead made by a skilled Italian glass maker, and features bright red glass that is decorated with genuine 24KT gold foil and white glass patterned into almost a lattice like design! The bead is thick and substantial and measures 1 inch each wide and long and about 1/4 inch thick! The entire pendant hangs 2 inches below the chain with my added Swarovski Crystal decor! The chain features beads that are vintage to my collection - they are Cherry colored Czech glass beads done in a flat rectangle shape. They are paired with Swarovski Pearls in gold and Red coral, along with Swarovski Crystals at the very front in Light Siam Red! The necklace is adjustable from 19 to 21 1/2 inches with a gold finished brass hook style clasp with extender chain. Thank you!